The projects range in scale and type from garden rooms, small houses and a wellness retreat to a new school, a bus interchange and a factory, and are located all around the country, from the Bay of Islands to Glenorchy. All of the shortlisted projects will be visited next month by a jury convened by Christchurch architect Jasper van der Lingen, and including Auckland architects Megan Edwards and Michael O’Sullivan and Melbourne architect Andrew Maynard. The winners in the New Zealand Architecture Awards programme, which is organised by the New Zealand Institute of Architects, will be announced at an event on Wellington on 11 November. Jury convenor Jasper van der Lingen said the awards shortlist provides evidence that high quality work is being produced by New Zealand’s architects across the full spectrum of contemporary architecture. “Private houses continue to be a strength of New Zealand architecture but it’s good to see that multi-unit housing is being designed to a high standard,” van der Lingen said. 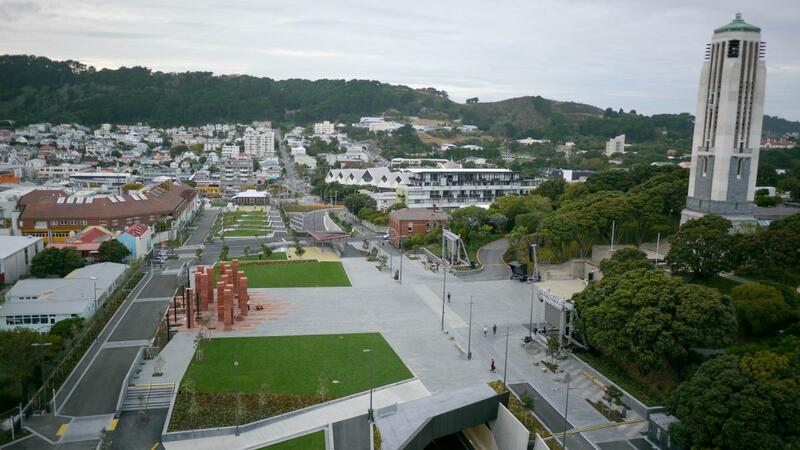 Aerial view of Pukeahu National War Memorial Park, courtesy of the Memorial Park Alliance.